Joy Creek Photo Archive (c) all rights reserved The specimen of Decaisnea fargesii in our garden is more than 20 years old and has obtained a similar number of feet in height. It is described as sparsely branched, but we see it as open in habit with large pinnate leaves up to 3 feet in length. Individual leaflets are mostly elliptic in shape, green on their upper surfaces and glaucous underneath. The subtle, bell-shaped flowers hang from the undersides of long panicles. 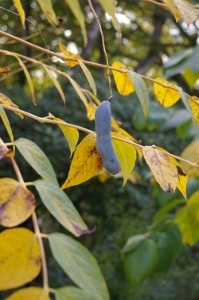 But, it is the large bean-shaped fruit that make this tree hard-to-forget for autumn visitors. The fruit form long, fat cylinders that are an unusual shade of blue and are often referred to as "deadman's fingers." From Western China and the Himalayas. Early Summer. 20 ft. x 20 ft.